The Seattle Mariners lost their head coach and finished the 2008 MLB season with a dismal 61-101 record. The Seattle Seahawks are under first-year head coach Jim Mora and are 2-6 with a banged-up quarterback. They are also missing a great running game they enjoyed in their Super Bowl run a few years ago. The University of Washington Huskies are 0-8 with no light at the end of the tunnel and head coach Tyrone Willingham will step down at the end of the season. And, to me, the most disappointing news out of them all is that Seattle no longer has an NBA team. 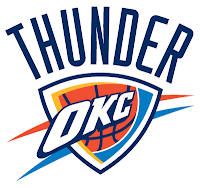 The team that used to be called the Seattle Sonics (or, Supersonics) is now the Oklahoma City Thunder. I just realized that in the past few days when I looked at the NBA scoreboard. The Oklahoma City Thunder. They may as well be called the Washington Generals, as they will be the inferior team to the "Harlem Globetrotters" of the league. This is obviously a year of CHANGE in more ways than one. And some changes are more difficult to swallow than others.